In France, Germany will not only be defending their status as world champions, but also their magnificent record in the European Championships. They have been champions and runners-up three times each, and reached the semi finals twice. However, Germany's last European title came back in 1996 and the 20-year wait is far too long for coach Joachim Low and his men. Germany attacked the UEFA EURO 2016 qualifying tournament aware that their triumph at the FIFA World Cup in Brazil in July 2014 would serve only to inspire all their opponents in Group D. The opportunity to take the scalp of the world champions would provide an extra incentive for Poland, Ireland, Scotland and Georgia, while Gibraltar would simply have been thrilled to be playing on the UEFA competitive stage for the first time. Not that Germany are unused to target status: their record of success since the Second World War is unparalleled in the European game. The pre-war era had brought “only" a third-place ﬁnish at the 1934 FIFA World Cup, but the game flourished in West Germany - the German Federal Republic - in the post-war era. Excluded from FIFA in 1946. they were readmitted to the world game in 1950 and won the FIFA World Cup four years later. That victory, engineered by coach Sepp Herberger, was all the more amazing because their opponents in the ﬁnal were the Hungarian “Magic Magyars", whose 3-2 defeat was only their second loss in ﬁve years. From then on the Germans grew in stature. At the FIFA World Cup, they were semi-ﬁnalists in 1958, quarter-ﬁnalists in 1962 and runners-up in 1966. The 1970s seemed to belong to Bayern Munich and West Germany. Bayern won a hat-trick of European Cups in 1974, 1975 and 1976 and provided the nucleus of the national side that won the European Championship in 1972, the FIFA World Cup in 1974 and, after ﬁnishing second in 1976, the European title once again in 1980. Franz Beckenbauer revolutionised the sweeper's role into one of attack as well as defence while Gerd Mliller was a goal-scoring machine with 68 goals in 62 internationals. Later heroes included Karl-Heinz Rummenigge, Lothar Matthaus, Rudi Voller, Jiirqen Klinsmann, Thomas Hassler and Matthias Sammer. 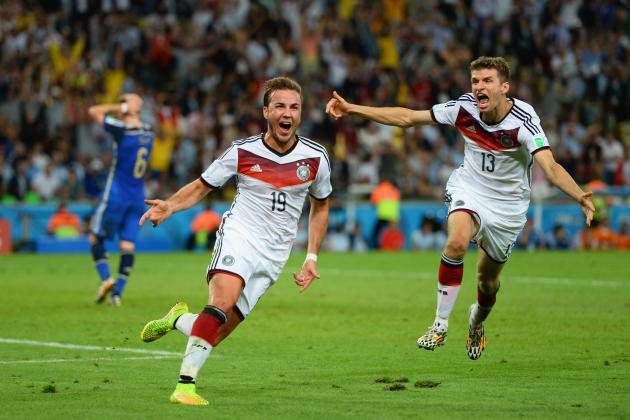 Mario Gotze was the youngest player on the pitch when he scored the 113th minute winner in the 2014 FIFA World Cup Final vs Argentina. Following the FIFA World Cup success and German reuniﬁcation in 1990, the Germans capitalised on their new-found resources by securing victory at Euro 96, That was their last senior title, until their dramatic victory in the ﬁnal of the 2014 FIFA World Cup against Argentina, thanks to a goal, late in the second period of extra-time, from substitute Mario Gotze. For coach Joachim Low, however, the new challenge presented by Euro 2016 required a new team, particularly following the retirement of so many of the 2014 FIFA World Cup winners. Two goals from Thomas Muller secured a narrow 2-1 win over Scotland, but next came a 2-0 defeat in Poland and then a 1-1 home draw with the Republic of Ireland. Three victories over Gibraltar (twice) and Georgia brought Germany back on track, and a 3-1 home win over Poland ﬁred them to the top of the table, a status they maintained all the way to the end of the qualifying competition, despite losing 1-0 to the Republic of Ireland in Dublin in the penultimate round of matches. Only one man played all 900 minutes in the ten qualifying ties, Bayern defender Jérome Boateng, closely followed by club-mate Manuel Neuer, probably the world's most innovative goalkeeper. Other pillars of the team were Bayern's Mats Hummels, Real Madrid midﬁelder Toni Kroos and the Bayern attacking pair of Thomas Muller and Gotze. 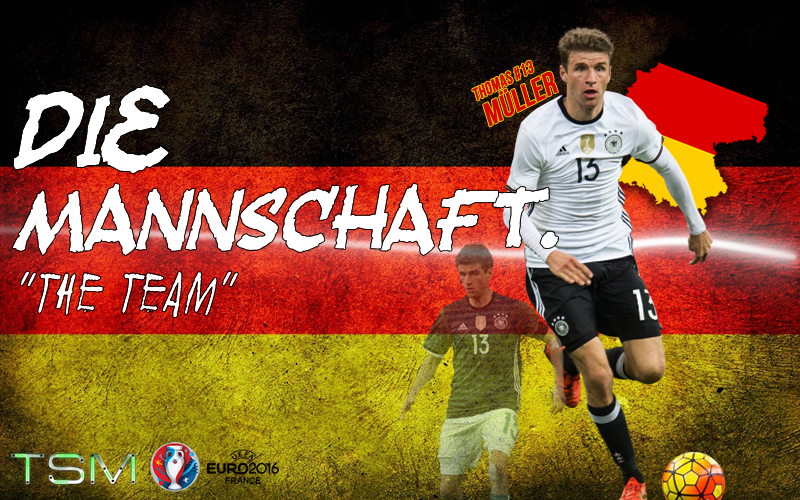 Muller was Germany's nine- goal top scorer in the qualifying campaign and he is sure to be as dangerous as ever in the ﬁnals. Germany have their fourth European title in their sights, but Joachim Low's men will need to be wary of slipping up along the way to the final. I expect them to make it through to the showcase final on June 10th but, it is so difficult to predict a winner in a major final of an international tournament. Marco Reus will be a huge miss after he was ruled out of the tournament with injury, and the lack of tournament experience in the side could mean that they won't be able to get the job done in France. 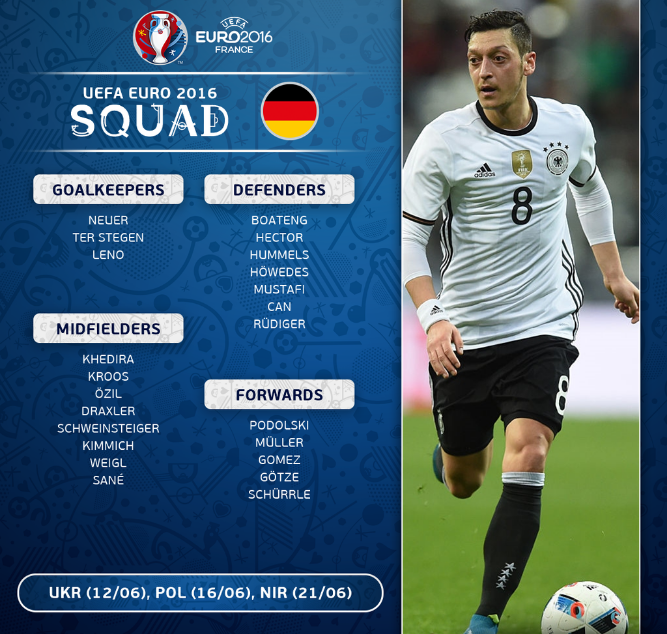 Euro 2016 Preview Series: Germany.